CRC, founded in 1990, seeks to narrow the gap between the traditional craftsman and the burgeoning demand of complex markets with the ethical paradigms of Fair Trade and the limitations of its resource persons. 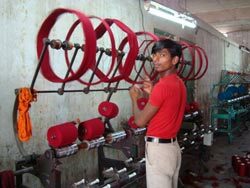 Its mission is to provide specific services that its associates - be it a craftsperson, a group or a micro-enterprise - need in order to take their income-generating endeavour to a self-sustaining level. CRC encourages the craft people to define their expectations, based upon their strengths and the market situation. CRC is involved in various community development projects such as mushroom cultivation in rural areas, soap nut collection for export or planning of effluent treatment plants in dye and printing units. These activities not only benefit the artisans but the entire community.